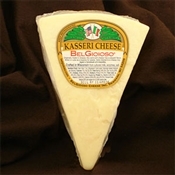 BelGioioso Kasseri is a semi-soft cheese that offers a slightly piquant flavor with a tartness that has a wide range of uses to delight the tastebuds. After four months of aging, this semi-soft cheese develops a slightly piquant flavor. 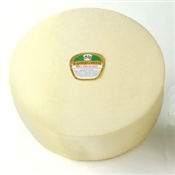 Made from whole cow's milk, this table cheese can be cubed, crumbled or shredded to add interest to salads, sauces and cheese trays. Because of its unusual ability to stay solid when heated, Kasseri can be served fresh from the grill on skewers, mixed with oiled sauteed veggies. This makes a sensational side dish or a complete meal served with a simple salad.